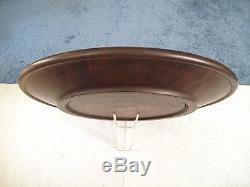 LARGE SOLID ONE PIECE CALIFORNIA CLARO WALNUT CENTERPIECE SERVING PLATTER TRAY PLATE. THIS IS A NEW turned, hand crafted plate! A MODERN twist on a COLONIAL/EARLY AMERICAN STYLE Trencher. Perfect Centerpiece, Turkey or Roast Platter for your holiday table! 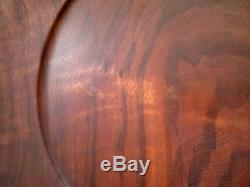 Collectable: For display or your turned wood vessel collection! HAND TURNED on a lathe from a single piece of solid 4" x 24" Claro walnut wood! The wood used was Air-dried for 5 years before being turned! Measures 3" x 23" diameter! Subtlely, skillfully curved surfaces do not trap food particles and allows for easy cleaning! Finish: Infused with walnut oil! All photos are of actual item! This walnut is'air dried' or naturally dried without a kiln. Which makes it far superior to forced air/kiln drying in every way! In structure, durability, workability as well as aesthetically and clarity! By clarity I mean that one can see'into' the wood! It has a depth, an iridescence that you just don't get with kiln drying! (Kiln drying collapses the cell walls and makes the lignin less elastic)! That fantastic golden orange coloring is the result! There are a couple natural surface checks that do not run through to the bottom or detract from the function or beauty of this piece! Common on one piece plates of this thickness and girth! They are SO slight that one wouldn't know unless one were told! And the checking is just a by product of the drying process and is in no way detrimental to the soundness of the wood! It hasn't moved in all this time and it never will! Keep it oiled and it will last forever! THE FINISH IS TOTALLY FOOD SAFE! So there is no need to worry about toxicity! It can be cleaned by hand-washing with a sponge, dish detergent and water, then toweled or air dried! For dried-on food: rinse with water and let it sit for a minute then wash. You can use a WHITE Scotchbrite pad but never, ever a steel wool pad such as Brillo! As indestructible as it is being painted, this TRAY is not a trivet, ovenproof or dishwasher-safe! Nor should it ever be left soaking in water! (No wooden kitchenware should EVER be)! Eventually, you will wash the oil away on the surface and it can look somewhat'fuzzy' over time! A little Scotchbrite and walnut oil will renew it! All photographs presented here are of the actual item(s) being offered! We'd like to answer your questions if needed beforehand. We're flexible, but communication is key. Please pay within 24 hours of receiving this invoice. Your item will be professionally and safely packaged! E-bay Required Notice to International Buyers. 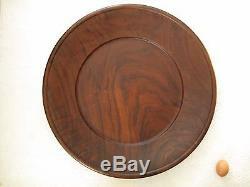 The item "Large 23 Walnut Centerpiece Wooden Serving Plate Platter Tray" is in sale since Friday, December 26, 2014. This item is in the category "Home & Garden\Kitchen, Dining & Bar\Dinnerware & Serving Dishes\Platters". The seller is "phlpshoh31wi" and is located in Cleveland, Ohio. This item can be shipped to North, South, or Latin America, to all countries in Europe, to Australia, to Japan, to China, KR, ID, to Taiwan, ZA, to Hong Kong, IL, to New Zealand, SG, SA, AE, QA, KW, BH, MY.